You'll find no one takes requests here. Learn to make the car yourself. I was going to say the EXACT same thing but I thought I'd let someone of higher rank and authority let him know instead. ^ You'll need to install that file first before you run Cared. ^ Used to install cars into the game. Their is a basic introduction tutorial included in the Cared.zip folder. I'm pretty sure there was actually a Ford Capri made. I remember it got posted on Ovalchat. Still had windows in etc though. 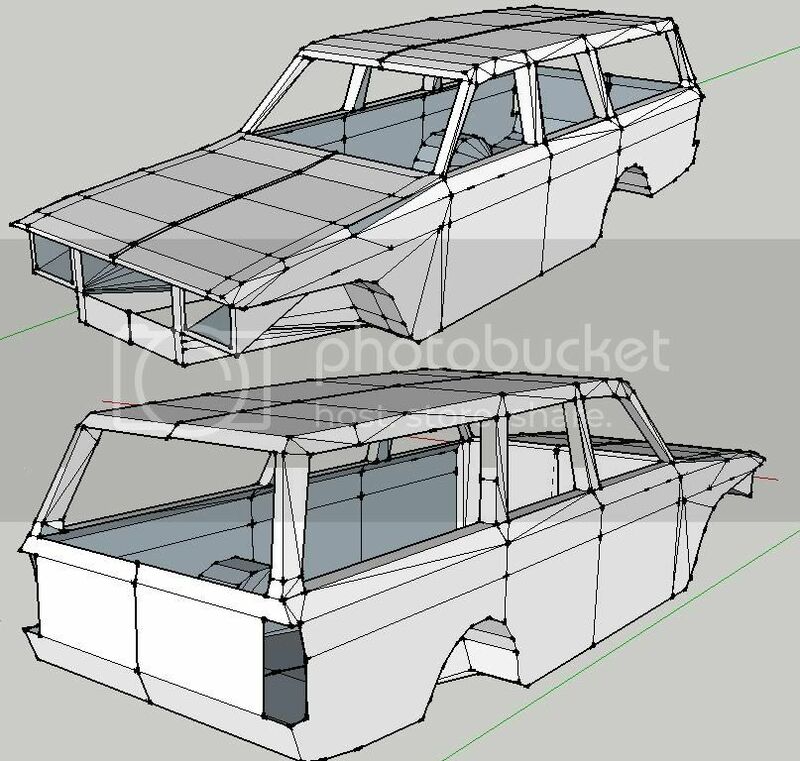 You know, there's also tons - TONS - of cars of varying quality and complexity at the SketchUp 3D Warehouse. Like Ford Capri models. I think a lot of the stuff in the warehouse are actually models inported from 3D Max and not made with SketchUp at all. I took the first one in the list and quickly slapped a photo texture on the side to see what it'd look like. But it needs engine, simpler wheels, driver so would end up at 3600 or so. If I am feeling bored and find some time I might work on this a bit. But I have a few things I am working on I need to finish. If I do it, it'd be a banger version. But I guess what I was trying to say is why aren't all the people with SketchUp using the 3D Warehouse to get premade models? Like I said, I think alot of the cars were made in 3D Max and imported into SketchUp so the polys are already flipped correctly. Just need to be reskinned and cleaned up, broken up the way you want the detachables, etc. All the usual stuff you'd do if you found a model on the web at TurboSquid or 3D Cafe or where ever. But just like any premade models some will have too many polys or are just badly made or missing parts. So you'll do some rework. But its quicker than scratch. - just give credit to the orig modeler! Thanks, I think I can find some pics. Found this site called Gooble or Gurgle or something like that? You type in a word and it finds stuff. I was working on the Capri some last night. I'm realizing that although the outside of the car looks good, there's no interior at all on the model. I am trying to figure out what I need to model and how I can do it without adding a ton of polys to the car. Engine - I know the hood/bonnet can't open, but you will see in thru the front grill. Maybe I can just put a flat texture of an engine behind the grill to trick the eye. Maybe add a rotating radiator fan for effect. Interior - on pictures I've seen, looks like the interior of a banger is gutted except for the driver seat? Does the dahboard stay intact? I hate to make a complete interior, it'll addd a lot of polys. I could make the exterior material two-sided. But the inside of the car will be the same as the outside. Maybe that's ok. But I don't like how it makes the car body look paper-thin. Doors - they can't open right? (stupid question I know) Is interior door panel removed so you see guts of door? Detachables - I guess not much is detachable. Front and rear bumpers. Rear hatch. Roof number fin. Anything else? Ineterior- everythings out exept the drivers seat. rollcage is fitted inside. Doors don't open at all. Drivers side, there is a plate that goes across the door. passenger side there are little bolts/plates that go across the side gaps of the door. I'll try and find some pictures aswell. Do you want damage pictures aswell, i dunno if you can programm how the car fold? last pic. dunno how to do multiple attachments sorry for 4 posts above. u can remove them wen u have them? Thanks for the pics, not sure why you didn't just zip them into one file. Meh. I can't deleted the post(s). Just erase what they say, so it ends up saying *deleted by coffeycup* kinda stupid I know. @timmy, cool! that looks good. But let's keep this on topic. You ought start a new Volvo one.